The dummy that Madihah Taheer bought. A WOMAN FROM Birmingham, England has been convicted of a terrorism offence after paying for a large combat knife for her husband to use in a UK attack. 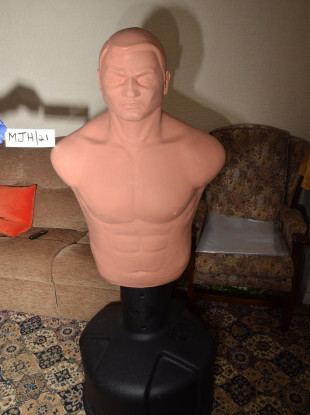 Madihah Taheer, the convicted woman, allowed her debit card to be used to buy a plastic knife and a life-like training dummy for her husband, Ummariyat Mirza, to practice an attack on. The dummy was found in their home with slash marks on its forehead, across the throat and abdomen. A few week before his arrest in March 2017, Mirza purchased a cord from an outdoor sports store, to which he attached the knife. He did so in order to carry the knife over his shoulder and conceal it under his clothing. He was also found to have researched potential targets on his mobile phone, including a military base in Birmingham. Mirza replied and told Taheer that “the day of nikkah [marriage] I’ll kill em all”. A month later while discussing the situation in Syria, Mirza said he wanted to stab someone they both knew 27 times, to which Mizra replied: “Sounds so satisfying”. The prosecution used these exchanges and other evidence to show that Mirza’s knife purchase was not for an innocent purpose. Mirza pleaded guilty to preparing for terrorist acts at a hearing on 29 September at Woolwich Crown Court. Her older sister, Zainab Mirza, also pleaded guilty on 9 October to sending him terrorist material. This included a video showing a hostage being beheaded and another being drowned in a fish tanks. All three defendants will be sentenced at Woolwich Crown Court. “There can be little doubt that Mirza had the knife so he could carry out a terrorist atrocity in the UK. The prosecution’s case was that his wife was a willing accomplice who bought the knife knowing what he was planning to do. Email “Woman who bought knife and life-like dummy for husband found guilty of terrorism in England”. Feedback on “Woman who bought knife and life-like dummy for husband found guilty of terrorism in England”.